← Off to a Tiki Start for 2013! 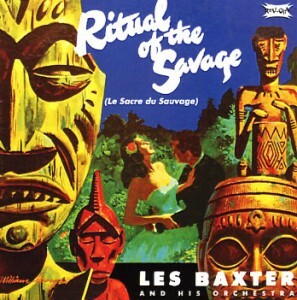 Kalua begins with native drum beats reminiscent of exotica, a musical genre that followed Les Baxter’s album Ritual of the Savage (Le Sacre du Sauvage) released in 1952. Tribal rhythms and exotic sounds on his classic “Quiet Village” transported folks living in the USA’s newly laid out suburbs to whatever exotic paradise their minds could conjure. They began calling their patios and screened in porches “the lanai,” building tiki bars, shaking up frothy, tropical concoctions in shiny aluminum cocktail shakers, and maybe even planting a Tiki or three in their back yards. In 1957, Martin Denny covered Les Baxter’s “Quiet Village”, with exotic bird calls and a vibraphone instead of strings, establishing the sound of the loosely (very loosely) Polynesian style music. In 1959 Denny’s “Exotica” album reached #1 on Billboard’s charts. Arthur Lyman and Juan Garcia Esquivel are two more favorites of the genre. Now a host of new exotica performers like Don Tiki and Kava Kon are following in their footsteps. Exotica albums are filled with the sound of bird calls–perfect for inspiring more hilarious scenes in the Tiki Goddess Mystery series that feature the now famous taste-testing parrot, David Letterman. Big-cat roars and shrieking monkeys, weird sounds of sirens “ooo-oooing,” chants, vocalized animal calls and growls blend with the haunting sounds of vibes, congas and bongos, bells and more. 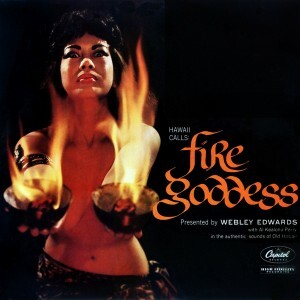 So whether you’re a fan of the Tiki Goddess Mystery series, a collector of all things Tiki, or hopefully both, why not take a time-out, kick back, and listen to some classic exotica music? No telling what taboo you might be inspired to break! Don’t think i qualify to be a tiki goddess any more. Too old!!!!! Ha Ha! We are the same age! Love your blog Jill. Can’t wait for the next book but am sad that there will be only three. The Hula Maiden series should live on. As we all know there is no end to our hula maiden antics and there will always be new material yet to be uncovered. Personally I think your books would make great comedy movies! loved the mai tai mystery. Can not wait for aeothnr one. Kauai is my favorite island and my husband and I will be there in Oct. We are going to introduce our middle son and his wife to our 3 pm Hawaiian habit Mai Tais poolside. Jill Marie Landis is a fabulous writer with entertaining, inventive plots. You will thoroughly enjoy her writing style. You’ll be glad you’re reading her books and you’ll laugh at the hilarious antics of her characters. Happy Reading!